For many years I have pondered the story of Anne Wessler. All I have had to go by in the past has been her photo, which I inherited from her daughter, my grandmother Gladys (Cant) Whittaker, a random comment by Nan to Mum and me perhaps in 1971 0r 1972: “My mother was adopted, you know” (Mum and I were completely taken by surprise – we asked no further details. Besides Nan was five when her mother died so she may not have known any more details); and eventually a death certificate. Prior to that we had taken for granted that Anne Wessler was the daughter of John Henry and Annie (Walsh) Wessler. Anne (Wessler) Cant’s Death Certificate reads: Died 1895, October 1 Morundah near Narranderah. Anne Cant, married. Female 26 years. Puerperal Peritonitis, (duration of illness) 10 days, (Medical Attendant) Walter Fox, (last saw deceased) 30 September 1895. Father: John Henry Wessler, labourer. Mother: Annie surname unknown [It was Walsh]. Certified by William Cant, husband; residence: Morundah near Narranderah. Signature of District Registrar: L.S.Donaldson, October 2, 1895, Narranderah. When and where buried: October 3, 1895, Morundah; acting undertaker: D.McLennan. Name and Religion of Religion, Names of Witnesses of Burial: P.McLennan, Layman, Roman Catholic; J.Villiers, D.J.O’Keefe. Where born, how long in Colonies: Young NSW [Question: How long in Colonies? – no information was included. The answer: 30-40,000 years!] When and where married: Goulburn NSW, 20 years, William Cant. Issue in order of birth, Names and ages: Lilian Gladys 5 years, Francis John Henry 4 years, Kathleen Stella, 2 years, all living. Today, while enquiring from Suzie at the Morundah hotel about the moving of the cemetery site she put me on to a man called Peter. It transpires that his (I think this is correct ) great grandfather D*( Douglas or Duncan ) McLennan was the acting undertaker at Anne’s burial. His brother, P (Patrick) McLennan was a witness. Another witness: D.J.OKeefe, owned Yamma Station, nearby to Morundah. 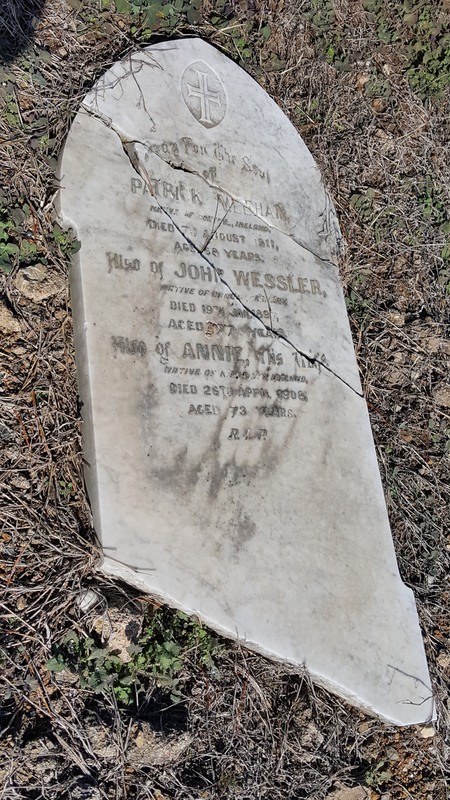 The cemetery is still there but has been closed and some of the coffins were relocated to Narrandera Some were left in situ and there are still some headstones visible. About 1/2 from the little town (Morundah) there is a billabong which is supposed to be where the aboriginals camped. Nine months after his wife’s death, William Cant married Sarah Grieves, in the Cathedral of Saints Peter and Paul, Goulburn, 20 June 1896. Sarah was not a Catholic. With three children aged five, four and two at his wife Anne’s death, no wonder William took another wife. William met her when he was moving around the southern parts of New South Wales with the railways in various capacities, as plumber, fettler and ganger; and Sarah was managing an inn or hotel in Jerilderie. Their children were William, born in Cootamundra, 29 May 1897; Clarence born in Jerilderie, 29 May 1901; and Mildred (Molly) also born in Jerilderie, 14 November 1904. On William Cant’s death certificate (died 11 December 1940, aged 74 years, at St Joseph’s Hospital Auburn, having lived at Brady Street, Merrylands, buried Rookwood Cemetery), Anne is simply referred to, under “first marriage”, as “unknown Welby”, which name was attested to by his son Clarence Cant, son of Sarah Grieves. It is odd that Anne’s daughter Gladys did not provide this information, even though she was alive and well and living at Boundary Street Darlinghurst. Did she go to her father’s funeral? It seems that Anne Wessler had disappeared entirely from the family scene. However, my grandmother Gladys obviously never forgot her mother, however young she was when her mother died. Was Anne Wessler airbrushed out of the story? I have a strong feeling that she was not talked about in Nan’s growing up time. Sarah M. Cant died 21 June 1941, aged 71, presumably buried at Rookwood, as her husband was. She too had lived at Merrylands. Now we can get a little closer to who Anne Wessler might have been. While we know nothing of her date of birth or who her birth parents were, we are certain that she was not the daughter of John Henry Wessler and Annie Walsh. For about twelve months (2017-August 2018) I have been engaged in the search of our family DNA. Not knowing anything about the purpose or results of the process, I was not clear on what a DNA research what would reveal – perhaps we come from a long lost understanding of who our forebears were: Vikings, Germans, Angles, Picts, Normans, Scandinavians, whatever. What I was to discover was that Mitochondrial DNA indicates my personal connection only to my immediate female ancestors – my mother Honor, her mother Gladys, her mother Anne Wessler and her mother, whoever she was. That line stops with me because the Mitochondrial DNA is passed down only through the female not by the male. While we share the genes of all our ancestors, male and female, the males do not pass on the Mitochondrial DNA. Paul and I, as well as second-cousin Warren, share the relevant mtDNA, it is not passed to any of our children, male or female. Thus it is not passed on to my brother Paul’s son Michael, nor is it passed on to our second cousin Warren Thomas’s children. However it is passed down by Warren’s sister Jeanette, because their mother Jacqueline was the daughter of Kathleen Stella whose mother was Anne Wessler. Similarly the DNA passes from my mother to my sister Adele, hence to her daughter Kathleen and her daughter Philippa. If Philippa has children the DNA will be passed on to her children, a son who does not pass it on, and a daughter who does pass it on. Of course Anne Wessler’s DNA is not passed on to my grandmother’s step brothers or sister’s descendants because theirs derives from Sarah Grieves, William Cant’s second wife. As we discussed, the key piece of information to bear in mind is that mitochondrial DNA is inherited only from mother to child. So your mitochondrial DNA (mtDNA) should be exactly the same as your mother’s, and her mother’s, and her mother’s etc etc…. So the results of your test through FamilyTree DNA won’t tell you anything about the rest of your forebears (neither your father’s side of the family, nor your maternal grandfather’s side), but they do tell you something about your maternal line. If you look at the screen print below (from your result on the FamilyTree website), you will see a table of numbers and letters. The letters (A, C, G or T) refer to the mutations that have accumulated in your line of mtDNA over the course of history, and the number refers to the positon on the mtDNA where this mutation occurs. These variations are identified by comparison to a reference mtDNA sequence (rCRS – the revised Cambridge Reference Sequence). These mutations have accumulated since early humans left east Africa. Using the accumulation of these mutations as a kind of molecular clock, it can be estimated that the Class of mtDNA known as the “N superhaplogroup” probably left Africa about 65,000 years ago, and is the forerunner of many European and Asian haplogroups. Your particular haplogroup (which is a sub-set of the N superhaplogroup) is the haplogroup S2. As far as can be told, this particular grouping probably separated off from the major Asian groups about 30,000 – 40,000 years ago. Most interestingly, the S2 haplogroup has only been recorded in Australian Aboriginal populations. So this evidence strongly supports your hypothesis that your maternal line is Aboriginal. I have attached a couple of scientific papers which provide background information to support this conclusion. … you can see the S Aboriginal line (including S2) on page 2 of the Nagle paper (the light blue squares) in figure 1. They don’t occur anywhere other than Australia. I have downloaded the raw data from the FamilyTree website and checked it with software from reputable academic sources – same result, so we can be confident that the S2 assignation is correct. Needless to say this has been a most exciting discovery. But, of course, we still do not know who Anne Wessler’s father was. All we can do is speculate! The Wessler family history has been traced by Norman McMahon. We corresponded for some years maybe twenty years ago and my last contact with him was by letter 6 January 2005. He provided for me a chart of the descendants of John Henry Wessler and Annie Walsh. Annie Walsh b. 1833 Kilkenny, Ireland, d. Goulburn, died 26 April 1908, aged 78. 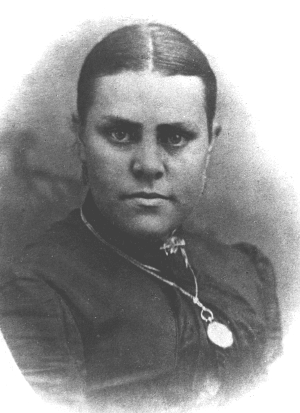 John married Annie Wessler (born Walsh) in 1862, at age 44. Annie was born in 1835, in Kilkenny, Ireland. They had one son: William H Wessler. John passed away in 1897, at age 79 at death place. [12 September 2018: photo of grave stone of (1) Patrick Meehan born Donegal, Ireland, d. 7 August 1911, aged 68 years; (2) John Henry Wessler, Hanover, Germany, d. 19 January 1897, aged 77; (3) Annie Wessler, Kilkenny, Ireland, d. 26 April 1908, aged 78 years. That should establish the death dates conclusively. Given that, John Henry was born 1820 rather than 1822. However, age at death is less able to be confirmed. Thanks to Kate Atthowe.] Patrick may have been the father of Mary Agnes Meehan who married John Wessler. We propose some major phylogenetic rearrangements … and redefined them as P4 (New Guinean) and P11 (Australian), respectively. … Nearly all Aboriginal Australian mitochondrial haplogroups detected appear to be ancient, with no evidence of later introgression during the Holocene. 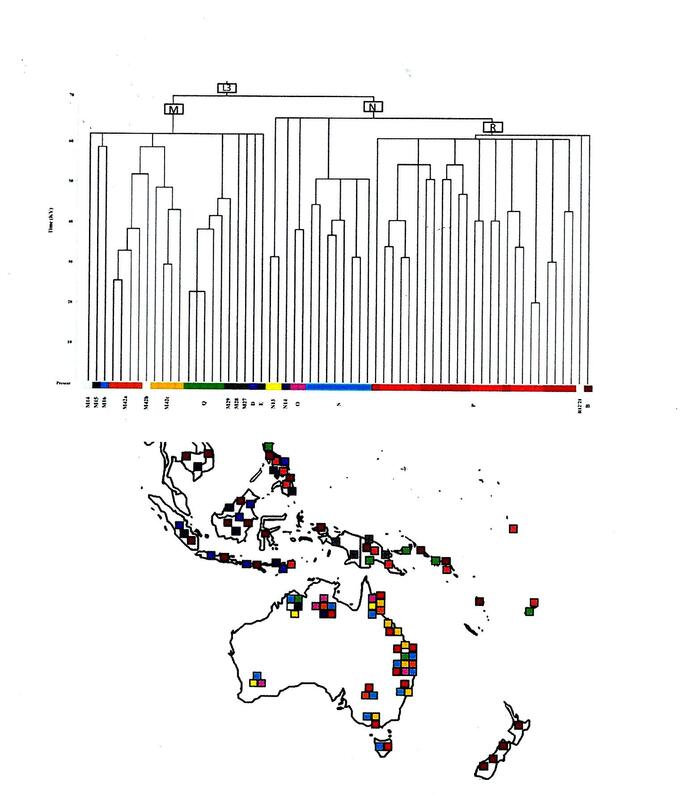 Our findings greatly increase knowledge about the geographic distribution and phylogenetic structure of mitochondrial lineages that have survived in contemporary descendants of Australia’s first settlers. The human colonisation of Australia occurred relatively soon after the migration of anatomically modern humans out of Northeast Africa some 60 to 80 thousand years ago (KYA = 1000 years ago). This initial settlement of Australia occurred between 47-55 KYA, based on the dating of archaeological sites dispersed throughout the continent, and the analysis of contemporary Aboriginal Australian DNA. Although there is consensus about the time the ancestors of Aboriginal people arrived in the ancient landmass of Sahul (which comprised Australia and New Guinea), there is debate over the route(s) taken by them to reach Sahul. This is mainly because the genetic structure of present-day Aboriginal Australians and New Guineans is different, implying a long separation that started at least 30 KYA. Did the colonisers enter Sahul via present-day New Guinea and subsequently spread southwards to Australia, or were there different routes into Sahul, such that one or more groups entered Australia via the ancient north western coast that is now submerged under the Timor and Arafura Seas? Furthermore, a mix of genetic, archeological, anthropological and linguistic data have suggested later migration(s) to Australia in the Holocene epoch, particularly from the Asian sub-continent. Phylogeny and geographical distributions of Aboriginal Australian mtDNA lineages and those of the surrounding regions of past and present studies. Adele reflects 27 August 2018: “I find I am looking at her more closely now that we know who she is. I’m sure you also see a strong woman, perhaps the strength you’ve talked about is the Anne influence and not only the Cant strength. She certainly does not look downtrodden or subjugated. The death certificate gives the duration of the cause of her death as 10 days so it confirms that she had been pregnant. Was it a miscarriage, or a still birth, I guess there is no record of either. I guess there wouldn’t be a record of a miscarriage or very preterm still birth in the 1890s. Either way there was obviously a sibling. In this account I use the name Anne for our subject. Sometimes the name is spelt Ann or Annie. There is a confusion with her adoptive mother Ann (Anne, Annie) Walsh-Wessler whom I will refer to as Annie. Information confirmed 13 August 2018. I may be mistaken in calling Sarah “Grieves” – the name may in fact be “Grieve”. It is said no record could ever be found of the marriage between William and Sarah, but there is certainly a record of it in the microfiche marriage records for 1896. Sarah Grieves was a very devoted support to William Cant in his Catholic commitment, especially towards the end of his life when he could not attend Mass. No haste there, as there was between the marriage of William and Anne and the birth two days later of their daughter Lilian Gladys. See chart below. If my reading is correct, S2 represents the major Wiradjuri groups who currently live in Condobolin, Peak Hill, Narrandera and Griffith. There are significant populations at Wagga Wagga, and Leeton and smaller groups at West Wyalong, Parkes, Dubbo, Forbes, Cootamundra, Cowra and Young. Norman is a direct descendant of his great grandparents John Henry Wessler and Annie (Walsh) Wessler. If AnnieWessler died aged 78, given that her birth year was 1833, the year of her death was 1901. In the absence of any proof of the year, I am at a loss concerning this anomaly. See Naturalisation Certificate document below. Munimel – the writing, to the best of my ability, looks to be “Munimel”. It could be 1892 – there is no way of telling. Norman McMahon, second child of Winifred Wessler and William McMahon and the source of much of this material, January 2005, gives the name as Henry Wessler, without John. He provides a detailed account of the descendants of Winifred, Kenneth and Agnes Wessler. Birth 1818 is at odds with my other information – 1822. However, the tombstone notes: aged 77, January 1897 – hence a birth year of 1820. In fact the son’s name was John. Note that Anne Wessler, my grandmother’s mother’s name, does not appear. I do not know how much the Wessler family knew about Anne Wessler. Norman McMahon did not realised she was an adopted child. I believe Olive and Amelia (Millie) ran a grocery shop at 88 Cavendish Street on the corner of Merchant Street, Stanmore. Our family lived at 93 Cavendish Street in the early part of the 1940s. Norman McMahon knew nothing of this information.